AVERISERA: Bow-on view. Hauled at Admiral's Hill Marina in Chelsea, MA. The Aphrodite 101 model sloop is uncharacteristically slender for the designs of the late 1970s. The IOR Rule encouraged beamy boats. The designers, Elvstrom and Kjaerluff tried something different, skinny. It worked out all right. There are pros and cons to skinny... and fat. We chose skinny. 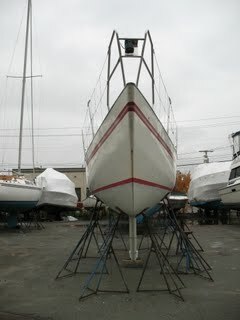 Slack bilges allow her to heel about twenty degrees without too much fuss. 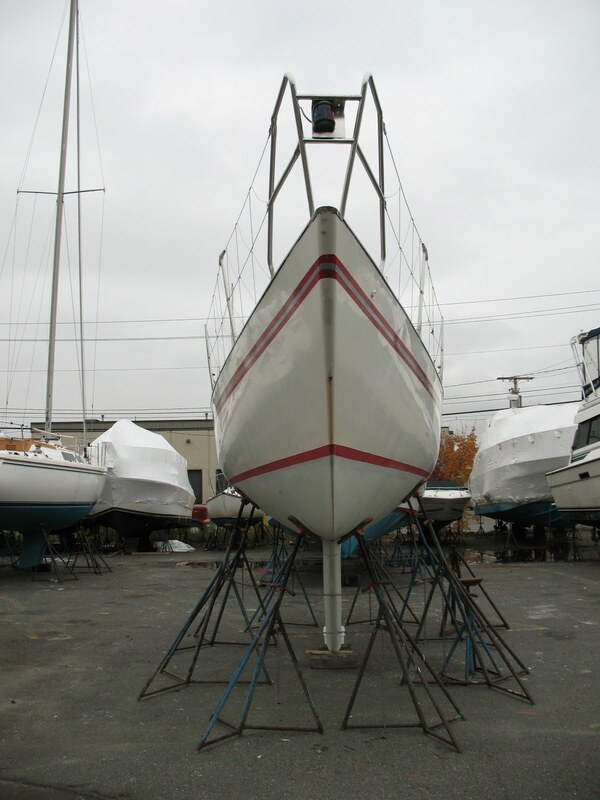 The hull bulge above the waterline immerses at that angle of heel and the boat becomes quite stiff. We have learned to reef as the angle of heel approaches twenty degrees. AVERISERA doesn't lose speed with the reduced sail area. The reduction in sail area reduces the leeway angle quit a bit, too. Narrow boats tend to go well in chop. Our boat has mostly dry decks. All good. AVERISERA on a hard reach down Cape Cod Bay in winds around twenty knots. The Number four jib (77%) and two reefs are pushing us along at near hull speed. The rail is just at the water's edge. 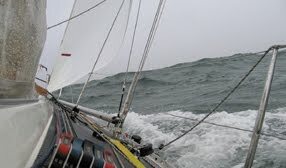 Except for the fog and cold and rain and lightning, it was a pleasant sail.